Do you have one of the several numbered limited edition ABBA releases?ABBA Omnibus is collecting the numbers that fans have in their collections. Whether it’s this year’s replica Eurovision medal, The Anniversary Collection singles box set from 1984, or any other numbered limited edition that have been released in the years between. You’re also welcome to submit a photograph of your item, or of you with your item. Go to http://www.abbaomnibus.net/ and click on Fans for details. ABBA by Micke – FANtastic Moments! is a great new book by German ABBA fan Micke Bayart. 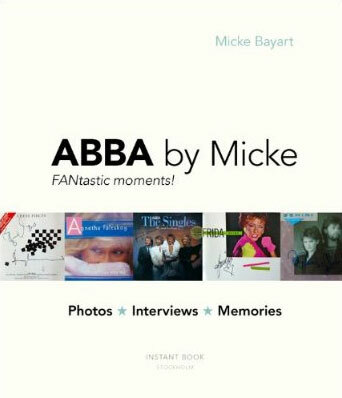 The book tells Micke’s personal story of growing up as an ABBA fan in Germany. As he got older between 1984 and 1988 Micke travelled across Europe to television studios, theatres, hotels, wherever the four former ABBA members were appearing to promote their latest projects. During this time he was a member of the team that put together the German fanzine ABBA Fan Blatt. Many of those meetings were documented in the pages of the fanzine, with exclusive interviews that are reproduced in the book. The book features many unique personal photographs by Micke and his friends, plus some rarely seen photos by professional photographers. The book is obviously a labour of love dedicated to a very special time in Micke’s life. ABBA by Micke was published in September 2011. See the book’s website for more information about the book and ordering links. Note: if you are ordering from Amazon.co.uk outside the UK use the second link, not the one for Instant Books fulfilled by Amazon. 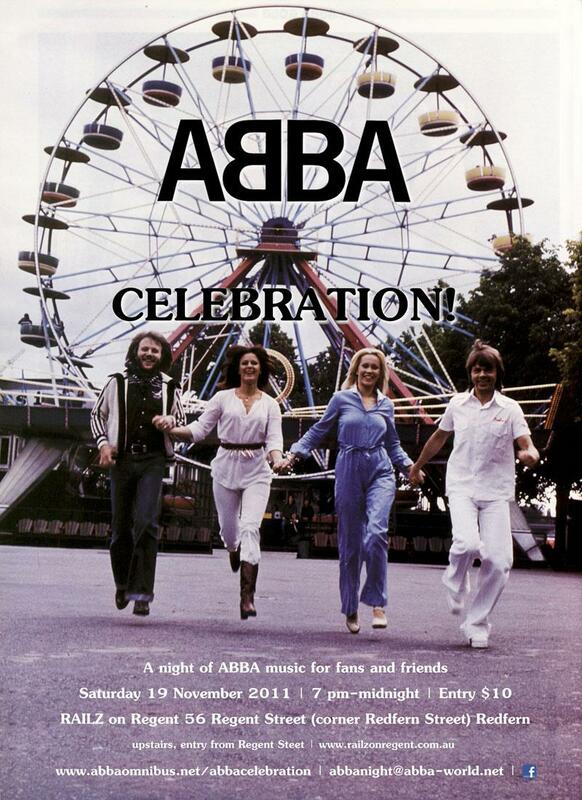 After the success of last November’s ABBA night in Sydney (Australia), and by popular demand, ABBA CELEBRATION! will be held again on Saturday 26 May 2012. ABBA CELEBRATION! will be held at RAILZ on Regent, 56 Regent Street, Redfern, from 7 pm through till midnight. 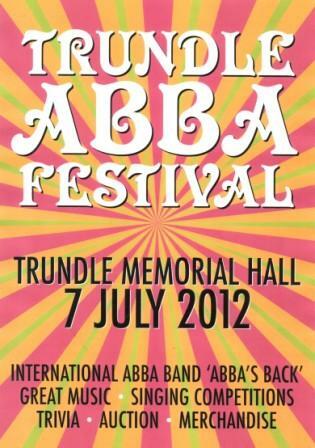 Five hours of non-stop ABBA for all fans and their friends. There is a $10 cover charge to cover costs for security and DJ hire, plus a selection of hot snacks. We’re taking over the entire upper floor of the venue – there’s an outdoor area to grab some fresh air, and a pool table if you get bored with all that ABBA music – yeah, right! If you’re in Sydney, or can get to Sydney for the night, you’re more then welcome. See here for more information. If you’re on Facebook you can RSVP here. It’s been a long time since there has been a gathering for ABBA fans in Australia. It’s about time that we get together again to share our love of ABBA! ABBA CELEBRATION! will be a night of ABBA music for fans and friends in Sydney. It will be held at RAILZ on Regent, 56 Regent Street, Redfern, from 7 pm through till midnight. Five hours of non-stop ABBA! There is a $10 cover charge to cover costs for security and DJ hire, plus a selection of hot snacks. We’re taking over the entire upper floor of the venue – there’s an outdoor area to grab some fresh air, and a pool table if you get bored with all that ABBA music – as if! If you’re in Sydney, or can get to Sydney for the night, you’re welcome! See here for more information. If you’re on Facebook you can RSVP here. British actor, singer, writer, comedian Christopher Green has been, like many of us, an ABBA fan since he was a child in the mid-1970s. In 2006, while performing at a function as his character country and western superstar Tina C, he was lucky enough to meet Frida, who happened to be a guest. That happenstance meeting started Christopher on a journey, looking into the nature of relationships, of love and loss. It also led him to reevaluate his relationship with his long-time idol. Later he would sit down for an intimate one-to-one conversation with Frida. The final result is a radio play broadcast this week on BBC Radio 4, Like an Angel Passing through My Room, named after the last track on ABBA’s final album, The Visitors. In the play Christopher recounts, both as narrator and in reenactments by two actors, that initial meeting with Frida. In conversation Christopher and Frida talk about relationships, both as fan and idol, and a surprisingly frank and personal reflection from both as they discuss the loss of their beloved partners. The play is incredibly moving. Like an Angel Passing through My Room can be heard for the next seven days on BBC iPlayer. If you feel moved enough to make any comments, you can send General Comments, Pick Of The Week, or Feedback. British TV network ITV is searching for information about the children’s choir that performed on stage with ABBA at Wembley Arena in November 1979, singing ‘I Have A Dream’, for their upcoming special The Nation’s Favourite ABBA Song. The producers are hoping to trace members of the choir to perhaps share that experience. If you have any information about the choir, or if you were one of the members of the choir, please write to news@abba-world.net as soon as possible. ABBAWORLD – The Official Interactive Exhibition opens in Melbourne, Australia on 19 June 2010. ABBAWORLD is seeking stories from Australian ABBA fans about their Australian ABBA experience for a special section of the exhibition telling the unique Australian ABBA story. Did you go to an ABBA concert, have special memories of watching an ABBA special on TV, do you have a favourite ABBA record or a special piece of ABBA merchandise, or any other special ABBA memory? If you are an Australian ABBA fan (past or present) and you have an ABBA story you’d like to share please contact me at phenomenon@abba-world.net for details. Stories must be submitted before Friday 11 June for inclusion in the exhibition. Australian fans are also invited to join the OzABBA group for all the latest Australian ABBA news. 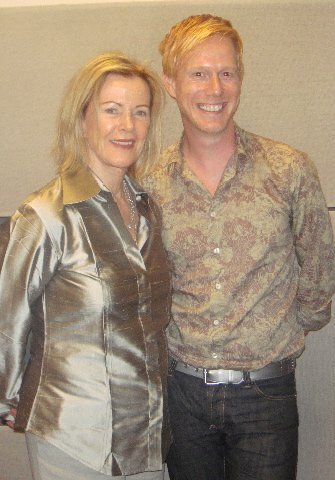 Australian ABBA fan Richard Simcock is a contestant on the cooking show Come Dine With Me Australia this week. If you haven’t seen the show five complete strangers host a dinner party over five night, with the guests grading the host on the food and entertainment, the winner announced on the night of the fifth party and receiving $2,000. There have been several series in the UK, this is the first local Australian series. Richard was a singer with the 90s pop band Indecent Obsession, and also a member of The Webb, who recorded a version of ABBA’s lamented unreleased track ‘Just Like That’. Come Dine With Me Australia screens weeknights at 8.30 pm on the Lifestyle Channel (Monday 18-Friday 22 January) , with repeats several times during the next couple of weeks.